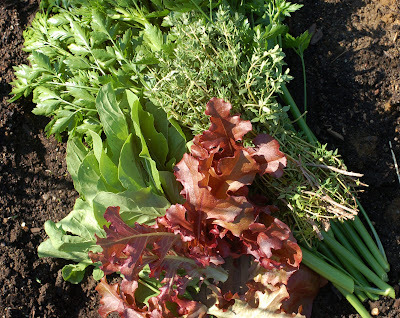 This is what I picked from the garden today: arugula, red lettuce, thyme, and flat-leaf parsley. The parsley was sown from seed last fall and it has grown into a gigantic bush. It is so great having our own fresh parsley again. Last year we had so much trouble getting it started from seed for some reason. Now we can hardly keep up with it! I am planning to make a tabbouleh salad with the leaves; Michael is going to use the stems, and the thyme, to make chicken stock. This evening we ate the lettuces in a simple salad with our dinner. 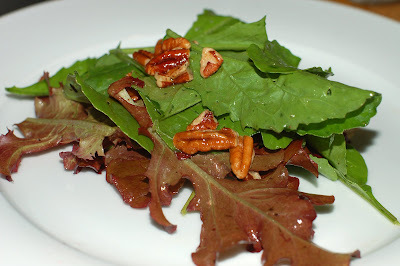 The nutty-peppery flavor of the arugula is incredibly delicious. I think it's my new favorite vegetable from the garden. Sometimes I even like to snack on it while I'm pulling weeds. It is so delicious -- even just by itself. What a delicious looking salad. All your greens look so healthy. I'll bet they taste great! There's not much better than a meal from your garden; it looks like a good one, too. I envious you, you got your harvest already from your garden, while me I just got my lettuce today, given to me by my kids. They're just going to be planted tomorrow. I guess I need a month before I can taste them. Lucky you. You must have a good weather there always. Here, it's just starting to warm up. That looks tasty. Arugula is supposed to be an aphrodisiac! Oh my gosh! I'm so jealous! That salad looks delicious. Congratulations! The salad looks great - we have managed to keep our parsley going all through the winter - must be global warming in the UK! Arugula is also my favorite salad green,so I can imagine how yummy that salad. 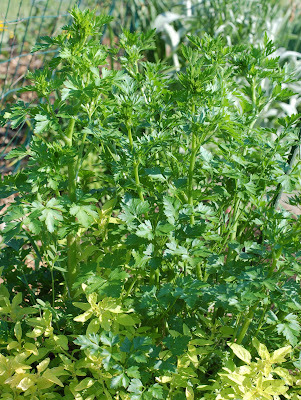 Flat leaf parsley is also one of my favorite herbs, and very versatile, though I haven't yet got lush plants like yours. Try making parsley pesto-either alone or or mixed with basil. Delicious. Parsley ? Dill? Like my tarragon - gone with the snails and slugs - I should give up gardening! Does that look good! Nothing beats fresh spring greens. It was really delicious. I can't wait until more of it grows and perhaps I'll try an arugula pesto. Nicole, the parsley-basil pesto sounds like an interesting combination, too. I'll have to try that. The parsley looks as if it is thriving. I would love to have tasted your salad. Yum! Such bounty from the garden already! I have some lettuce and parsley that overwintered (and my parsley has exploded, too), but other than that it's mostly sprouts so far. Oh, and I've heard that parsley is hard to start from seed, which I found to be true when I first grew this bunch. Planted quite a bit of seed with low germination, but the effort is certainly worth it!